When Detective Sime Mackenzie boards a light aircraft at Montreal’s St. Hubert airfield, he does so without looking back. For Sime, the 850-mile journey ahead represents an opportunity to escape the bitter blend of loneliness and regret that has come to characterise his life in the city. Travelling as part of an eight-officer investigation team, Sime’s destination lies in the Gulf of St. Lawrence. Only two kilometres wide and three long, Entry Island is home to a population of around 130 inhabitants – the wealthiest of which has just been discovered murdered in his home. The investigation itself appears little more than a formality. The evidence points to a crime of passion: the victim’s wife the vengeful culprit. But for Sime the investigation is turned on its head when he comes face to face with the prime suspect, and is convinced that he knows her – even though they have never met. 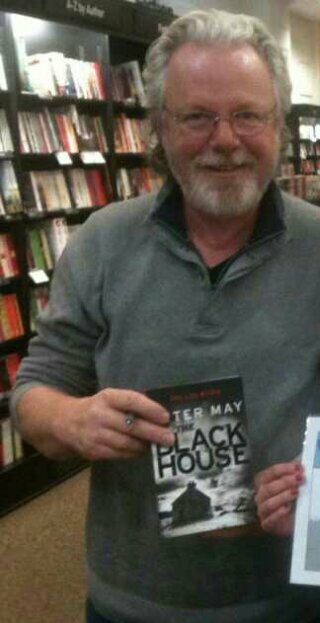 To anybody that knows me they will know how much I love the Island of Lewis and the Outer Hebrides Islands of Scotland, so in 2010 when Peter May came out with his first novel in the Lewis Trilogy, The Blackhouse I was so excited and could not wait to see how the books would pan out, and by 2012 with the last novel The Chessmen I was sad that the series had come to an end but was excited to see what Peter May would write next. What came next was Entry Island and it fully deserves the five stars and if I could have given it more I would, as the style of writing he used in the Lewis Trilogy has quite successfully been applied to Entry Island, the only difference being half of the novel has been shifted to a small Canadian Island. The other half of the novel tells the story of our main character Sime ancestor and his life growing up during the Highland Clearances and the events that lead to his new life in Canada and how that effects Sime and the accused Kirsty. With all that in mind Entry Island keeps us wanting more and puts you through an emotional whirlwind that will have you distracted for all your normal duties, so it is best to read this book when you know that you have a lot of time on your hands as you won’t want to put this book down when you start reading it believe me. The reason for this is that he makes his characters and places come alive and you feel like you have just been transported into the novel and you are seeing and experiencing what his characters do. 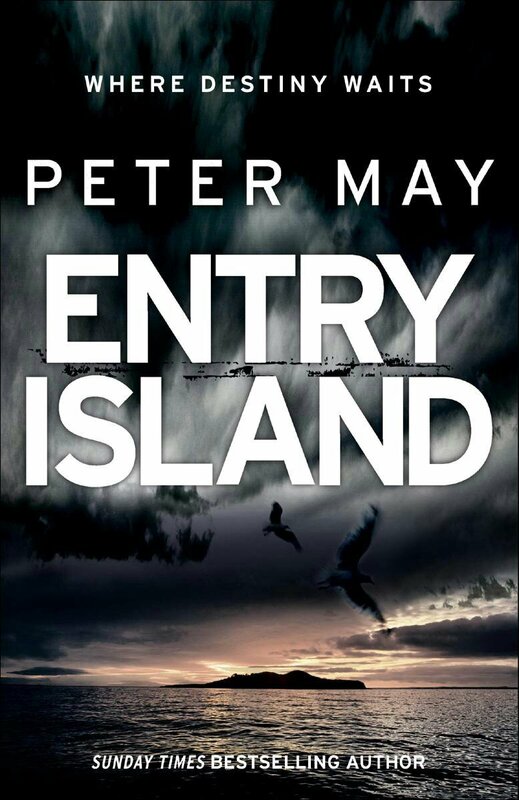 So I do hope that this is a start of another series of books from Peter May as I really loved Sime and Kirsty and there is definitely more we would all like to know about them and I think it could be possible to combine both sets of lead characters from Entry Island and The Lewis Trilogy e.g. Fin and Marsaili would that not be something. Some secrets can be deadly . . . The featureless corpse lay like a grotesque department-store mannequin, elbows and knees flexed, fists clenched. Wisps of smoke rose from its still-burning torso. Recently-widowed GP Zoe Moreland really wishes she’d chosen another route to walk her dog on November 6th. Had they gone away from the village, Mac could not have led her to the body lying in the remains of a Guy Fawkes bonfire. Zoe’s move from an English city to the Scottish Borders was meant to be a fresh start among strangers unaware of her past. Instead, she is thrust into the limelight by her grisly discovery and gets caught up in the resulting murder investigation. Then someone else dies unexpectedly and Zoe herself narrowly escapes death. Determined not to become the killer’s next victim, she digs beneath the tranquil surface of the close knit community to find out who is committing these horrible acts. But uncovering other people’s secrets puts Zoe in even more danger . . . I was a typical only child, an avid reader with an overactive imagination who wrote stories and poems as soon as I could hold a pen. As an adult, in every job I had, I was the one who ended up writing whatever needed to be written, often for colleagues who hated doing it themselves. So it feels inevitable – and wonderful – to have ended up writing full-time, first as a copywriter and now as a fiction writer. What drew you to write a crime novel? Quite simply, crime fiction is what I love to read. I can’t imagine writing in a genre I don’t enjoy, at least not for an entire novel. Which writers past or present have influenced your style of writing? I’m not aware of any direct influence, in that I’ve never set out to write like anyone else. But storytellers like Robert Goddard and Reginald Hill showed me how good books can be, and made me determined to write as well as I can in order to entertain the reader. What was the inspiration behind the Westerlea Mysteries? I knew I wanted to write a novel and that it would probably be crime, but I had no idea where to start. Then I was at a Bonfire Night party and the idea for an opening came to me: a body in a Guy Fawkes bonfire. That’s probably as far as my inspiration went: it’s been hard work ever since. Did you find it hard to get a publisher interested? I didn’t get as far as that! I sent out my novel to a few agents and had a near-miss with one of them, but I hated the powerlessness the submission process inflicts on writers. Having seen friends like Mel Sherratt and Peter Flannery successfully self-publish, I decided to have a go myself. Like anything, there are good and bad aspects of self-publishing, but 5-star reviews and meeting readers who have enjoyed No Stranger to Death make it all worthwhile. There are so many interesting characters in No Stranger to Death. Do you have a favourite one? That’s like asking a parent who their favourite child is or, in my case, who’s my favourite pet! However, I admit to having a soft spot for Kate Mackenzie, deaf genealogist and best friend of my main character, Zoe Moreland. Kate is the complete opposite to Zoe: outgoing, enthusiastic and with the confidence that comes from being supported by a loving family. I plan to give Kate her own storyline in Book 2 and explore her will they/won’t they relationship with DCI Erskine Mather. Your book is a rollercoaster of emotions and thrills. Do you have a favourite scene that you can share with us? 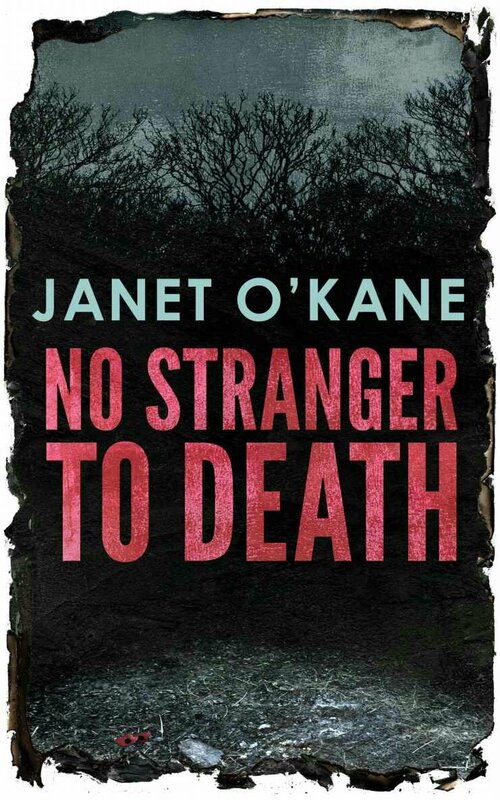 No Stranger to Death is a crime novel which revolves around relationships, including Zoe’s with her ardent admirer Neil Pengelly (although for a long time she disputes that they even have one). I was surprised how much I enjoyed writing the scenes between those two characters, and I guess one of my favourites is the morning after Zoe’s car crash, when Neil is taking care of her. It’s a respite from the book’s sinister events and proof of the growing intimacy between them. Why did you decide to set your books in the Borders? It’s where I live, so I don’t have to go far to research locations. Also, I wanted to do something a bit different. As far as I know, the Borders hasn’t featured in a series of crime novels before. 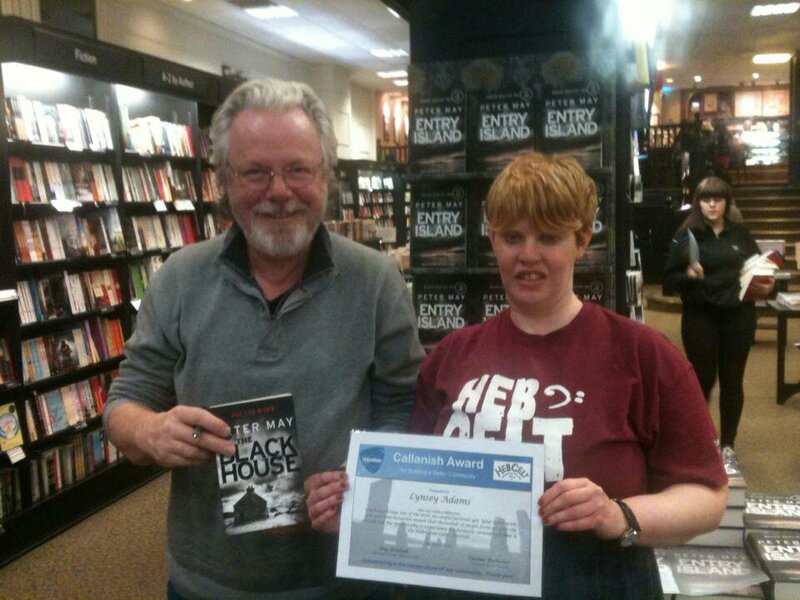 Mention ‘Scottish crime fiction’ and readers usually expect a city setting: Glasgow, Edinburgh or Aberdeen. Settings influence events and people’s reactions to them, so No Stranger to Death would have been a very different novel if it had taken place somewhere else. What kind of research did you have to undertake for your book? Research is far too enjoyable: I have to rein myself in or I’d never get any writing done. My brother-in-law is a policeman, so I can check facts with him. I also went to Hawick police station and a detective there kindly showed me behind the scenes, the cells and interview rooms, etc. My GP was also extremely helpful. Apart from that, I like to visit locations I’m going to write about, not just to describe them accurately but because they often stimulate story ideas. Are the characters in your books based on any real life people? No, I’d never do that. But I have taken elements of people I know and blended them into my characters. For example, Neil Pengelly’s shaven head (a friend kindly submitted to me running a hand over his scalp at different stages of regrowth), Paul Ryder’s endless collection of tartan ties (as worn by my last boss), and names such as Kate’s mum, Etta (which is a tribute to our late neighbour – it wasn’t until she died that I learnt her name is actually short for Janet). Since you started writing, have any well-known authors given you any advice? 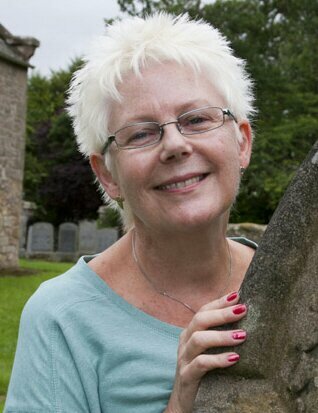 I went on an Arvon crime-writing course back in 2002 and was lucky enough to be tutored by Val McDermid, whose books I’ve always enjoyed. The advice she gave us which has stuck in my mind most is that if you want to be a published author you must treat it like a job – sit down and write every day, even if that’s the last thing you feel like doing. Do you see any of your characters’ personality in yourself and vice versa? A friend insists that Zoe is me, which is disappointing as I worked really hard to avoid that comparison! I purposely gave Zoe characteristics I don’t have but wish I did, such as very long hair and the courage to do things like drive a fast car and go scuba-diving. That said, it’s impossible to write without elements of oneself seeping onto the page, though I thought I’d covered that by giving Zoe my liking for taramasalata and carrot cake. What do you see for the future of Zoe Moreland in your books? Book 2 opens about six months after the end of No Stranger to Death, and Zoe is still dealing with the fallout from those events. One consequence in particular is affecting her life in a way she could never have imagined. I can’t tell you what that is, but I will say that I’m going to have to do a lot of research for it. And then she’s called out to examine a body of a young man who has been pulled from the River Tweed. As a blossoming crime writer, do you have any words of advice you can share? Being middle-aged, I love the idea that I can still blossom! With just one book published so far, I don’t feel qualified to offer much advice to other writers apart from read, read, read in your chosen genre. If you don’t enjoy a book, try to analyse why it didn’t work for you – that can be as instructive as examining books you do like. I also recommend getting hold of Jeff Gerke’s Plot versus Character and reading it from cover to cover. I come from a big family, and I mean BIG, I have six sisters and two brothers. Growing up with so many siblings meant it was sometimes a bit difficult to get heard. My way of standing out was to to tell stories. And I’ve never stopped. However, I never thought to write a story down until my mum died. After her funeral I was helping my dad sort out her things. We found a small case full of Mum’s private letters and dairies, all written in German – you see, mum was a Christian German girl, who came to Scotland after the end of World War 2. I’d studied German and began to translate the documents for my father. As I read, the more shocked and horrified and saddened and dismayed I became. I discovered that my mother and her family and thousands and thousands of other ordinary Germans had suffered terribly under Hitler. I felt compelled to tell Mum’s story and decided the best way to do this was to write a book about her life. That book is The Blue Suitcase – and writing The Blue Suitcase is how I got started writing. 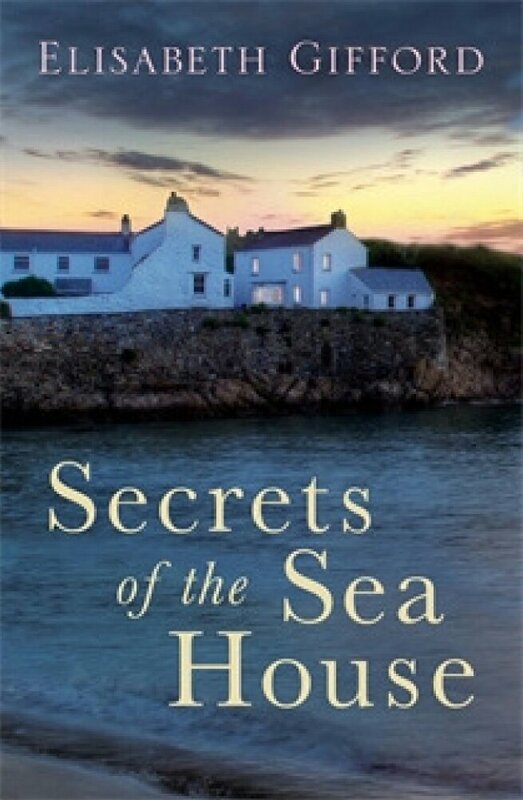 I love reading crime fiction and have many fond memories of staying up to the wee hours, gripped by a crime story, unable to put my book down until I had discovered who had done it and why – and that they were safely locked up! I believe a good crime novel can tell us as much about the dark side of society as any literary novel, and I am fascinated by the dark side of society – I think most of us are. What was the inspiration behind Foods of Ghosts? I used to live and work on Tarawa, the capital of Kiribati, which is where Food of Ghosts is set, and, according to the world Tourism Organisation,the third most remote country in the world.While there someone I knew drowned. It was an accident but I felt the accident was the indirect result of a kind of bullying. It set me thinking about why people behave the way do and the circumstances that can drive ordinary normal people to kill. The seed for Food of ghosts was sewn! When you first started writing did you find it hard to get publisher interest? The first time I sent out the manuscript for The Blue Suitcase a very lovely, lovely, lovely agent called, Kate Jones, who at the time worked for ICM in London, was really interested. We talked at length over the phone and I looked forward to being represented by her. However, very, very sadly for her and her family, she tragically got breast cancer which spread to her liver and she died. I felt a bit a drift after that and unsure who to approach next. This is when my husband, who owns Pilrig Press, a micro publisher here in Edinburgh, offered to publish me. We’ve never looked back. There are many interesting characters in Food of Ghosts, do you have a favourite one? DS Louisa Townsend, of course, but me next favourite is Tererei, Joe’s mother. You have also written a novel called the blue suitcase which is not a crime novel but set during WW 2, do you find it easy to switch between genres like this or is it quite difficult? It can be difficult to switch because the books are not only different genres but they are also set;in different places and cultures at different periods of times. But at the same time, it also refreshing to to switch from one to the other. Why did you decide to set your books in the Gilbert Island of Tarawa? I lived on Tarawa for five years. I loved being there. It’s an extraordinary place, with extraordinary people, before I’d lived there I’d never even heard of it. Most people haven’t – it really is very remote. I thought it could be very timely to bring Tarawa and Kiribati to readers in the Western hemisphere because not only this is a place worth knowing about, if global warming predications are correct, the islands may soon be under water and cease to exist. For The Blue Suitcase I had my mum’s dairies and letters to guide me,. But I also went to the library and studied everything I could about Silesia( where my mum was from in Germany) from 1900 to 1945. I lived on Tarawa for five years, so that gave me the knowledge to write Food of Ghosts. I also have my friend, Jim, who is an ex-detective, who has given me excellent police procedural advice. Are the characters in your books based on any real life? In The Blue Suitcase, yes, of course, the characters are based on my mum and her family. In Food of Ghosts the characters are totally fictional, but inspired all different people I met while living on Tarawa and elsewhere. Since you have started writing have any well known authors given you any advice? I’ve been lucky to meet a lots of lovely writers, such as James Robertson and Sara Sheridan, and Ian Rankin and Doug Johnston and Shari Low and James Brett, and Janice galloway and Chris Brookside and Mark Billingham and Pat Barker. I have always found writers to be very generous with their time and advice. They know what it’s like, there is no easy way to becoming a writer. Do you see any of your characters personality in yourself and vice versa? I think of my characters as opposites of me. They can do the things I would never dream of. What do you see for the future of Detective Sergeant Louisa Townsend in your books. 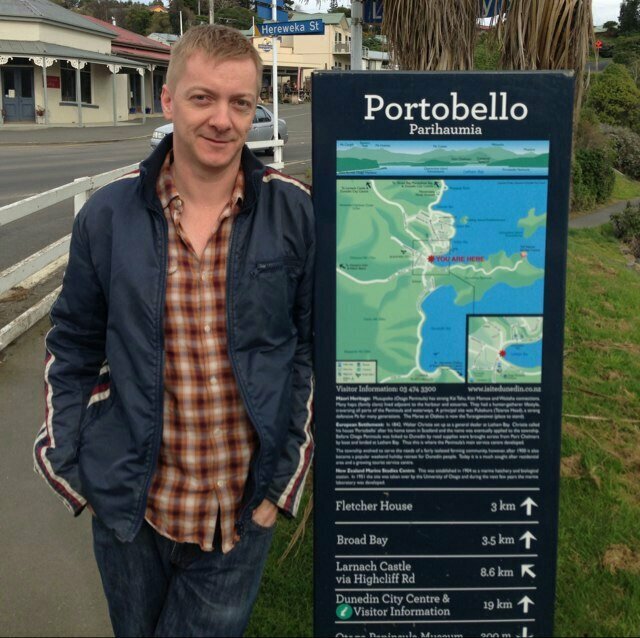 DS Townsend is going to visit a number of other Pacific countries and solve crimes there – the next Pacific novel, which is the second in a series of five in the Pacific, and which I am in throws of editing, is set on Fiji. Ultimately, though, she will return to Edinburgh. You have been compared in your writing to some of the big names in Scottish Crime Fiction already, how does that make you feel? Gosh! Totally honoured to be compared to any big name, but especially to anyone in Scottish Crime – my favourite of all crime fiction. As a blossoming crime writer do you have words of advice you can share? When a young woman is found unconscious at the wheel of her car, evidence at the scene suggests this was no ordinary crash. Especially when it turns out her boyfriend is the son of the Scottish Justice Minister and neither of them is willing to talk to the police. Meanwhile, John Rebus is back on the force, albeit with a big demotion and an even larger chip on his shoulder. A new law has been passed allowing the Scottish police to re-prosecute old crimes and a thirty-year-old case is being reopened, with Rebus and his team from back then suspected of corruption and worse. Known as ‘the Saints’, his colleagues swore a bond of mutual loyalty on something called ‘the Shadow Bible’. But with Malcolm Fox as the investigating officer – and determined to use Rebus for his own ends – the crimes of the past may not stay hidden much longer. With political turmoil threatening to envelop Scotland, who really are the saints and who the sinners? And can the one ever become the other? After reading Standing in Another Mans Grave last year I was really happy to see the return of John Rebus and Siobhan Clark and every Rankin fan got their wish in that he brought in his new creation Malcolm Fox and his Complaints Team into the mix as well. After reading that book we all knew that it would have a love or hate relationship with the die hard fans, some would be on Team Rebus and others would be on Team Fox, so it is nice to see in the new Rebus novel Number 19 Saints of the Shadow Bible that the two old foes can be brought together in a way that satisfies everyone who loves and enjoys Ian Rankins novels,This book fully deserves the five star rating that it has been given and if I could have given it a higher mark I would have, it has all the classic markings of a great Ian Rankin novel in that it has the great character relationship, the brilliant storyline that keeps you guessing up to the final pages, takes you on a rollercoaster ride of ups and downs and has you up all day and night waiting to find out what happens. 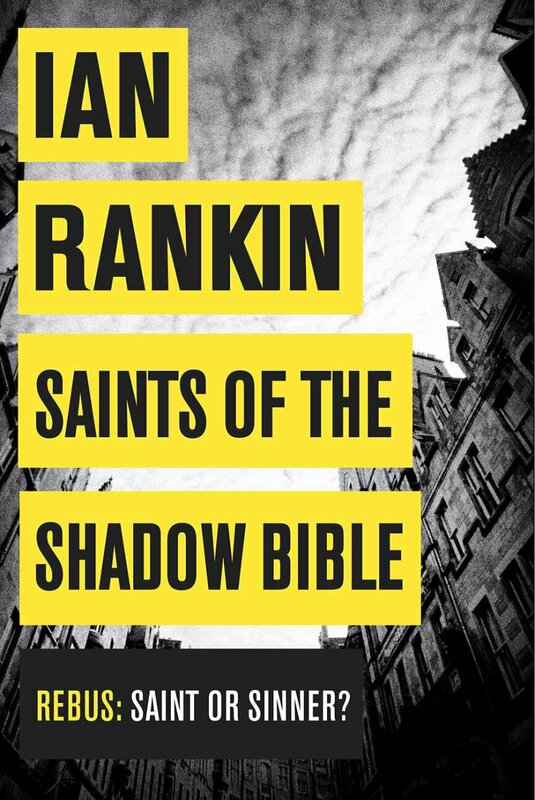 I hope now that 2014 will give us a new Clark, Fox and Rebus Novel number 20 as the way in which Ian Rankin has incorporated the New POLICE SCOTLAND and has managed to introduce us to new characters and make others fit into the fold, and shown us why he is considered by many to be the face of Scottish Tartan Noir. I for one have a lot to thank Ian Rankin for us he was the author who introduced be to the exciting world of Modern Day Scottish/ British Crime Fiction and for that I will be entirely thankful, as he opened up by eyes to a bunch of great Crime Author’s who I have had the pleasure of having over on this blog and who in turn have made me pround to be Scottish and have made others look at Scottish literature in a completely different light and brought it to the attention of thousands of people world wide. I wasn’t a great reader at school but as I grew older I started to buy books to take on holiday with me and that’s when I realised what I had been missing. I was in awe of these people, these authors who could write books that grabbed my attention and made reading so enjoyable. I decided that I wanted to try and do that. 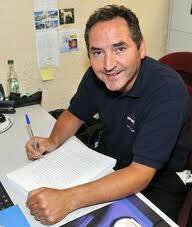 I retired from professional football in 1991 so I found that I had a bit more time on my hands and I thought to myself ‘I’ll write that book now’ but that didn’t happen. I didn’t even put pen to paper. And then three years ago, thirty four years after I had last written anything at all, a college project on the ups and downs of Heathcliffe and Cathy in Emily Bronte’s Wuthering Heights, it happened. An incident took place while I was on holiday with my wife and as we sat in the hotel reception area on the last day of our holiday, I actually started to write MISSING. This is my favourite genre. I like to read books that make me use my ‘little grey cells’ as the famous Belgian sleuth always says. I like nothing better than lying beside a swimming pool reading a good crime novel with plenty of twists and turns, a book that keeps you in suspense right to the end. You can’t beat it. I realise that this genre is not everyone’s favourite but I felt that I should stick to what I know, so to speak, when writing my own book. There are plenty of writers who I really like, Tess Gerritsen, Jeffrey Archer, Michael Connolly, John Grisham and Harlan Coben. But the two writers who I feel have influenced my style of writing the most are Lee Child and James Patterson. I love Lee Child’s Jack Reacher character and the way he has him roaming across America getting himself involved in all sorts of dangerous situations, and the books are so easy to read. As for James Patterson, I think he’s probably influenced me the most. He is similar to Lee Child in that he has also created a character that I love – Alex Cross. But it’s not only the Cross series of books that I like, it’s all of his books. He justs grabs your attention from the very first page and with his short chapters he holds it to the last page. My kind of books. My wife and I were on holiday when we had a small luggage bag stolen as we waited for a taxi to take us to our cruise ship. It was a terrible feeling but we both decided that we weren’t going to let it ruin our holiday. So we went on our cruise and then returned to our city hotel for a further day. We were on a night flight so we decided to go for a nice walk to take in the city one last time. We were feeling a little peckish so we went into this little cafe where we were served by a lovely Spanish lady who informed us that her husband absolutely adored Scotland and everything to do with it. She then curiously said that he likes Scottish fighting men, which I must say rather confused me and I can remember thinking to myself ‘does she mean boxers like Jim Watt or Ken Buchanan?’. But then she made it all a bit clearer when she said Braveheart was his favourite film and that he adored the fighting Scotsmen in that film. She continued to say that he really loved one in particular, and he was in that film. She was obviously thinking of William Wallace but she couldn’t think of the name and became very annoyed with herself, but she made it clear that she didn’t want me to tell her. I sat silently waiting for her to remember the name and sure enough seconds later she shouted it out. I was absolutely astounded and shocked. I told her that that was my name and asked her why she had said it. It was very SPOOKY. We finished our tea and left. It had started to rain so we only walked about one hundred yards down the street and then turned to head back to the hotel. We walked straight back up the same street that we had just walked down but we couldn’t find the Cafe again. It had somehow disappeared. I know that sounds crazy but as soon as I got back to the hotel I started writing, as a story had started to brew in my mind that our mysterious Spanish lady had something to do with the theft of our bag. Why had she said my name? Had she been rifling through the papers in our stolen bag just before we entered her cafe? And was that why the name McGuire was so fresh in her mind? Whatever happened that day, it is certainly the incident that inspired me to write MISSING. That is a definite YES. In fact I couldn’t find a literary agent. I sent my manuscript to many agents but all I received in return were rejection letters. It was very disheartening but I had been warned that it would be extremely difficult to find an agent and then of course a publisher. 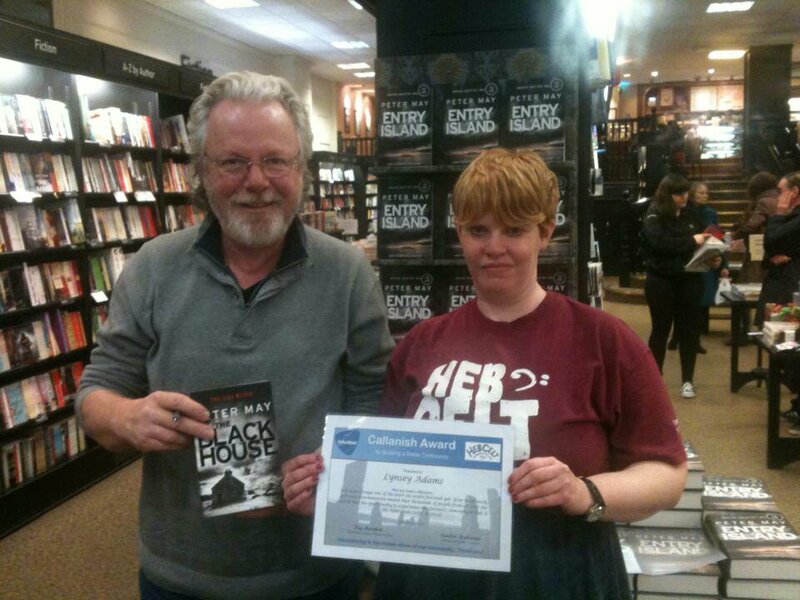 I did receive some nice letters from agents, one in particular from Val McDermid’s agent, which did perk me up. She said that she liked it but they weren’t taking on anyone else at that particular time but that I shoud keep trying. She added that she thought that it would ‘really take to the screen’ as she put it, and asked me if I had any experience in screenwriting as that would give me another chance. That was a non starter but her reply did encourage me to keep going. However I finally decided to stop sending my manuscript to agents and made the decision to self publish through a company called Createspace, a part of Amazon. I’m really glad that I did. It’s probably the lead character David Telfer. People who have read the book all seem to be able to relate to him and everybody just seems to like him. There’s another character in there who is hardly in the book but I really like him and that’s Rupino the waiter on the ship. The reason for that is that he’s actually a real person and the conversation that David Telfer has with him about Manny Pacquiao on deck 15 is the conversation that I personally had with Rupino one day when I was having a few cocktails at the Sky Bar. He just reminds me of that wonderful day. Because that’s the city where the bag incident described above took place. My wife and I were going on a Meditteranean cruise and we had to board the ship in Barcelona. So you see, the start of my book is based on an actual incident that took place just outside of our hotel in Barcelona. It’s such a beautiful and vibrant city with so many fantastic sights to see that I decided it would also make an ideal backdrop for my mystery/thriller. That’s a hard one. I would have no problem doing another stand alone novel, but the two authors who have influenced me most have both done a series with their Jack Reacher and Alex Cross characters. I seem to be attracted to these types of books so I suppose I would like to create some character that I could use again and again in my own series of books. I simply went on holiday. When you visit places like Barcelona, Valetta, Naples, Livorno, Rome and Cannes, you come back with so many wonderful memories that it’s easy to recall them and put them down on paper. In Barcelona for instance we took the hop on hop off bus which takes you round all of the major sights in the city. There’s no better way of seeing a big city. The only place we didn’t take some kind of tour was Naples, but that was unforgettable for one thing in particular…the drivers. So I just brought my memories back and used them in my book. As I have already said, the start of Missing is based on an incident that actually took place involving my wife and I, when we had our bag stolen in Barcelona. The cruise that David and Louise Telfer took is the identical cruise that my wife Joyce and I took. But the actual characters are not based on myself or my wife Joyce. All of the other characters I simply made up, apart from the waiter Rupino who is a real person. Yes. 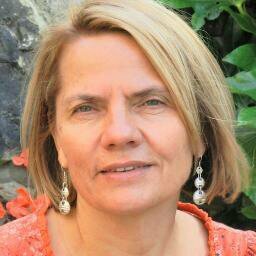 Anna Smith who has written the Rosie Gilmour series of books..The Dead Won’t Sleep, To Tell the Truth and Screams in the Dark. I love her books and as you can see there’s another character there who I seem to have fallen for in Rosie Gilmour. It was Anna who encouraged me to send my manuscript away in the first place as she really liked my story. She also warned me that it was extremely difficult to get published but the fact that I was an ex-professional footballer might help me achieve my goal, as she didn’t know of any other ex-player who had actually written a mystery/thriller by themselves. (It’s usually autobiographies or a collection of football stories written by someone else). I had to agree with her there because I believe that the general public think most footballers are thick and I wanted to try and prove that that’s really not the case. Her last piece of advice was to start writing my next book as soon as possible. No. I like to distance myself from the characters in my book. If anyone who reads the book and sees parts of my personality in any of the characters of MISSING then so be it, but it cerainly wasn’t planned that way. As I write this I’m thinking of doing a sequel. The story of David and Louise Telfer may not be finished yet! Obviously it makes me feel wonderful and is very flattering indeed. However I am just so happy that I have achieved my ambition of publishing my own book and that real people actually take the time to write a review on Amazon saying how much they enjoyed it. It’s similar to the feeling that you get when you score a goal and you hear that ball hitting the back of the net. Yes. It’s not advice specifically for crime writers, it’s for all writers. DON’T GIVE UP when you’re finding it difficult to find a publisher, it happens to everyone. KEEP GOING and don’t be frightened to self publish. Believe in yourself. He’s back…Eight years ago, ‘The Inside Man’ murdered four women and left three more in critical condition – all of them with their stomachs slit open and a plastic doll stitched inside. And then the killer just …disappeared. Ash Henderson was a Detective Inspector on the initial investigation, but a lot can change in eight years. His family has been destroyed, his career is in tatters, and one of Oldcastle’s most vicious criminals is making sure he spends the rest of his life in prison. Now a nurse has turned up dead on a patch of waste ground, a plastic doll buried beneath her skin, and it looks as if Ash might finally get a shot at redemption. At earning his freedom. At revenge. He’s touching the front of his coat, feeling the shape of the gun. Should have got rid of it. On any other night, any other job, he would. This isn’t any other job. This, he intends, will be his last . . . It begins with two deaths: a money-man and a grass. Deaths that offer a unique opportunity to a man like Calum MacLean. A man who has finally had enough of killing. Meanwhile two of Glasgow’s biggest criminal organisations are at quiet, deadly war with one another. And as Detective Michael Fisher knows, the biggest – and bloodiest – manoeuvres are yet to come . . . The stunning conclusion to Malcolm Mackay’s lauded Glasgow Trilogy, The Sudden Arrival of Violence will return readers to the city’s underworld: a place of dark motives, dangerous allegiances and inescapable violence . . .
Preston and Lang investigating the death of a young girl in an old Manor house in Glasgow gets their minds ticking. Who would want to kill an innocent girl in her own home and why? They believe their questions have been answered and the case is closed. Sam Leonard could not be happier, he has an amazing acting career, an loyal best friend and a fantastic girlfriend and after a previous turbulent relationship, what could go wrong? 2014: The Commonwealth Games is coming to Glasgow and security is extra tight, particularly after a mysterious bomb explodes in nearby countryside. As the opening ceremony for the Games draws ever closer, the police desperately seek the culprits. But Detective Superintendent Lorimer has other concerns on his mind. One is a beautiful red- haired woman from his past whose husband dies suddenly on his watch. Then there is the body of a young woman found dumped near to the bomb site who is proving impossible to identify. Elsewhere in the city people prepare for the events in their own way, whether for financial gain or to welcome home visitors from overseas. And, hiding behind false identities, are those who pose a terrible threat not just to the Games but to the very fabric of society. Alex Gray’s stunning new Lorimer novel, set against the backdrop of the Glasgow Commonwealth Games, brings the vibrant city to life in a race to stop the greatest threat the city has ever known. He’s dead. So says his own newspaper, the Glasgow Gazette: Douglas Brodie, 25th January 1912-20th July 1947. Just 4 weeks before, a senior banker was kidnapped. Brodie delivered the ransom money on the instructions of the abducted man’s wife, but the drop went disastrously wrong. Brodie was coshed in the kidnapper’s den. He woke with a gun in his hand next to a very dead banker with a bullet in his head. The case against Brodie is watertight: the bullet comes from his own revolver, the banker’s wife denies knowing him, and his pockets are stuffed with ransom notes. In an apparant act of desperation, Brodie cheats justice by committing suicide in his prison cell. Could this be the sordid end for a distinguished ex-copper, decorated soldier and man of parts? Suspended from the Association of British Investigators and facing an enquiry into his alleged misconduct over four years previously, J. McNee’s career hangs in the balance. The last thing he needs is new business. But when the mother of a murdered child asks him to re-open a case he helped close during his time in the police, McNee can’t refuse. If you’re so special, why aren’t you dead? Meet Martha. It’s the first day of her new job as intern at Edinburgh’s The Standard. But all’s not well at the ailing newspaper, and Martha is carrying some serious baggage of her own. Put straight onto the obituary page, she takes a call from a former employee who seems to commit suicide while on the phone, something which echoes with her own troubled past. Setting in motion a frantic race around modern-day Edinburgh, The Dead Beat traces Martha’s desperate search for answers to the dark mystery of her parents’ past. The body of a murdered woman is found washed up on Cramond Island near the mouth of the River Forth. Days later detectives are called to a flat in Edinburgh; the kitchen is covered in blood, and the occupier is missing. James Machie was a man with a genius for violence, his criminal empire spreading beyond Glasgow into the UK and mainland Europe. Fortunately, James Machie is dead, assassinated in the back of a prison ambulance following his trial and conviction. But now, five years later, he is apparently back from the grave, set on revenging himself on those who brought him down. Top of his list is his previous associate, Frank MacDougall, who unbeknownst to D.I. Daley, is living under protection on his loch-side patch, the small Scottish town of Kinloch. Daley knows that, having been the key to Machie’s conviction, his old friend and colleague D.S. Scott is almost as big a target. And nothing, not even death, has ever stood in James Machie’s way..
For five years Priest’s Island has guarded the secret of Max Wheeler’s disappearance. Each anniversary the boy’s family gathers at the scene to mourn his loss and to commission a new inquiry into the mystery. So far a retired chief constable, a private detective, a forensic archaeologist and a former intelligence officer have failed to uncover what happened to fourteen-year-old Max. Now Cal McGill, an oceanographer with expertise in tracking bodies at sea, has taken up the quest and finds himself caught between a father hell-bent on vengeance, a family riven by tragedy and a community resentful at being accused of murder. As Cal goes about his investigation he discovers an island that provokes dangerous passions in everyone that sets foot on it. And he has a nagging worry: if Max was murdered why shouldn’t it happen again? 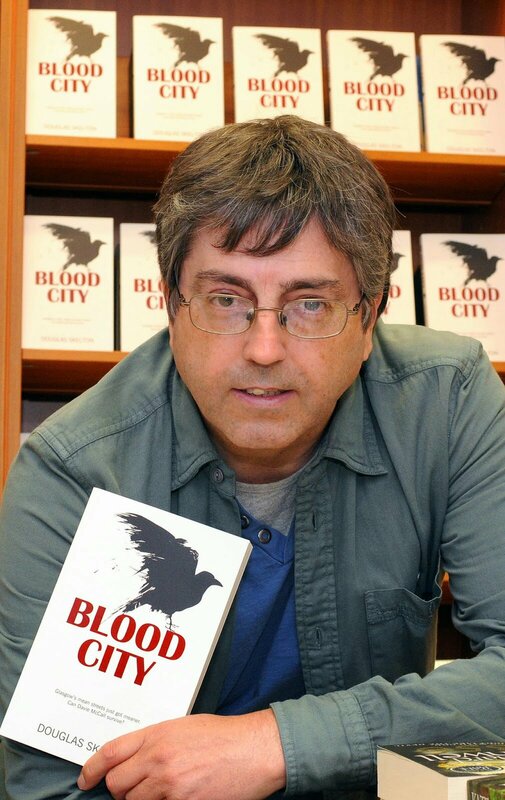 Douglas Skelton is an established true crime author, penning eleven books including Glasgow’s Black Heart, Frightener and Indian Peter. He has appeared on a variety of documentaries and news programmes as an expert on Glasgow crime, most recently in the Glasgow programme of ‘Gangs of Britain’ with Martin and Gary Kemp. His 2005 book Indian Peter was later adapted for a BBC Scotland radio documentary which he presented. His book Frightener, co-written with Lisa Brownlie, was instrumental in cleaning the names of two men wrongly imprisoned for mass murder and is currently being developed as a feature film. Blood City is his first foray into fiction.